Am delighted to bump into your rich blog. How come I found you just now? Makes me wonder how many more in the Ilocano bloghood I have not visited. By the way, I and my colleagues are going to Adams this Sat, and we are so thrilled at the prospect. I am sure you have enjoyed your visit to Adams. I love that place. Hope to meet you in person one of these days. Visit Adams I have not. It's a long story, but let me just say that circumstances were not my side. 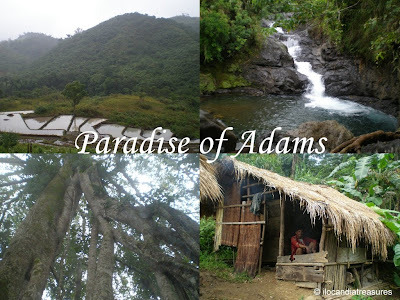 Anyway, a research team from MMSU are doing an inventory of Adams' flora and fauna, and they are inviting me to join them on Feb 9-13. This work is very important because the natives will then be guided on what to protect in their land, which is now an eyecandy to mad developers, miners, and greedy human beings. I have reservations though because I have already promised to entertain guests during the fiesta. But to paradise i will go in due time. You are doing a really excellent job. Ilocos is fortunate to have you. And yes, I chanced at you during IN's 191st Anniv celebrations last week, and the way you smiled while taking pictures showed how much you love what you do. Thank you Herdy for appreciating my blog. There's so much to write about Ilocos. Little by little we cover them. I think that research project would do a big role in preserving the environment and at the same time educate the locals on how to give importance to their flora and fauna. Hope in the next time you see me you would tap me and maybe we engage in a talk.